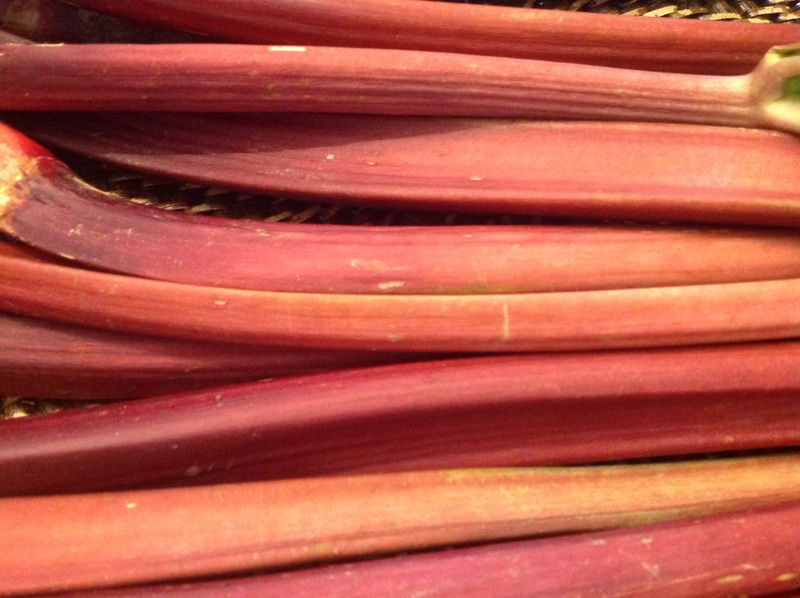 It’s rhubarb season and everywhere in farmers’ markets the gorgeous stalks are awaiting transformation in the kitchen. This pound cake showcases tart slices of the fruit encased in a batter made with olive oil, yogurt and scented with aromatic cardamom and orange zest. Each bite still lets the beloved tartness of rhubarb shine. 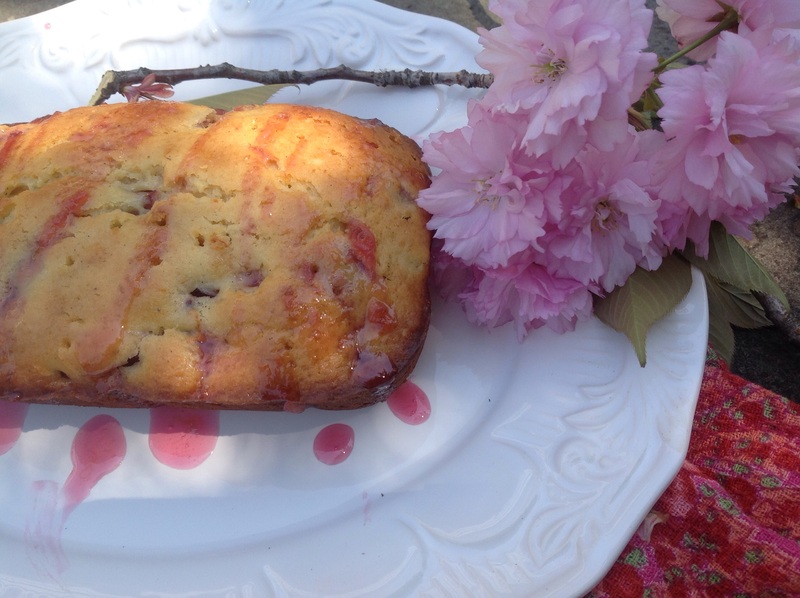 The result is a moist delectable cake with a gorgeous pink rhubarb glaze. I divided the batter in mini loaves so I could freeze them. The recipe can make a classic loaf as well. Rhubarb is prized nutritionally for its low calorie, high fiber content. Rich in antioxidants, minerals and vitamins, it provides B complex vitamins, iron, copper, calcium, potassium and phosphorus. Cardamom is also rich in antioxidants, iron, manganese, vitamins B amd C, potassium, calcium and magnesium. (Www.nutrition-and-you.com). This is a cake with a huge nutritional punch! While it is in season, take a bunch of rhubarb home and get creative incorporating it into your cooking. Preheat oven to 350F. Grease either a mini loaf pan or full loaf pan with the butter. Toss the rhubarb with the 1 T flour. Combine the dry ingredients in a bowl: flour, baking powder, salt, cardamom. Mix together the wet ingredients: eggs, sugar, zest, olive oil, yogurt, vanilla. Gradually add the dry ingredients to the wet until just combined. Fold in the rhubarb. Pour batter into the prepared pan. 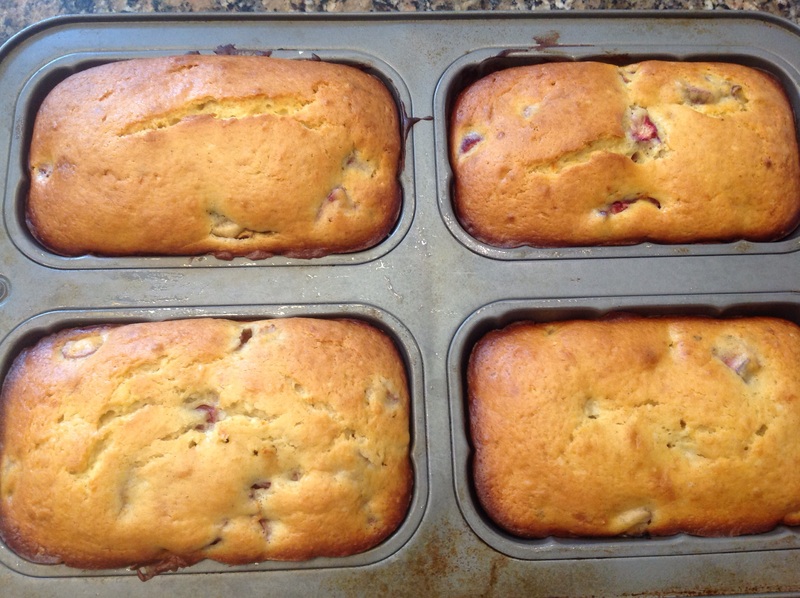 Bake in the center of the oven for 40-45 minutes if using a mini loaf pan or 50-60 minutes if using a full loaf pan. 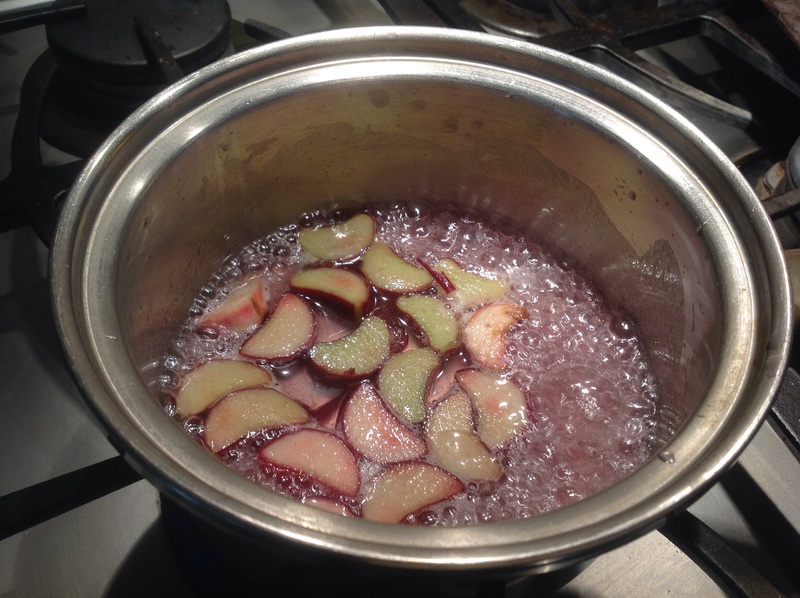 To make the rhubarb syrup, bring the rhubarb, water and sugar to a boil, reduce heat and continue cookiing until syrup is pink and able to coat the back of a spoon, about 10 minutes. Puncture the cake with a toohpick and pour the strained glaze over, while it is still warm. Serve plain or with a dollop of whipped cream if desired. This entry was posted in Recipes and tagged Rhurbarb olive oil pound cake with cardamom and orange zest by Johanne Lamarche. Bookmark the permalink. A pound cake is a good way to ease into it or a strawberry rhubarb pie! I can’t wait until our rhubarb has grown enough so I can start using it! The flavours of this cake sound wonderful–cardamom and rhubarb! I’m jealous! I grew up with homegrown rhubarb. Lucky you! Now I buy it. Rhubarb is just a huge favorite! This sounds so good! Of mine also! Happy days are here again! 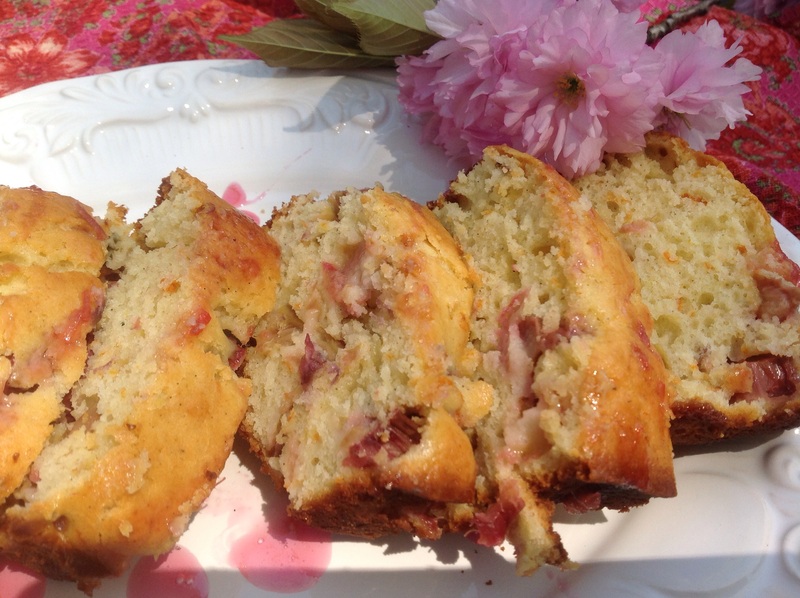 I love baked rhubarb and this does sound delicious! Thanks Julie! 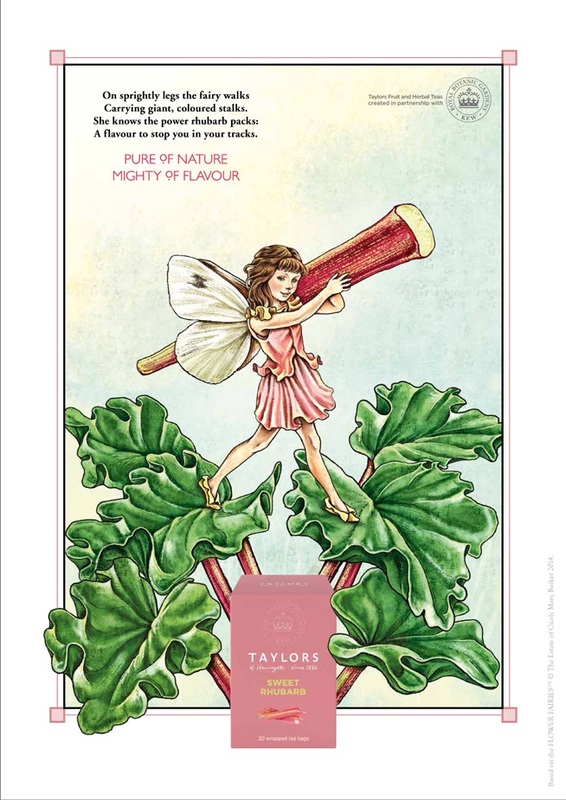 I love rhubarb too! The pie is the classic but this sure was moist and tasty. I could just kick myself as I just passed up some stalks of beautiful rhubarb at the market this morning! If I had it I could make this lovely pound cake, slice it, toast it and eat it with my coffee in the morning. Alas, I will have to wait another day. Wonderful post Johanne. Thank you Teresa! I was thinking of you when I went searching for an art piece featuring rhubarb, evidently not a popular subject! Glad you enjoyed the post. Oh, rhubarb! You can invite me 🙂 What a great recipe, thanks for sharing. Come over! There’s one loaf left and a big batch of rhubarb compote too!